When people visit a bowling center, they don’t just go for the fun of the game. Many guests want to make an afternoon or night out of their trip, and indulging in food offerings is also part of the experience. 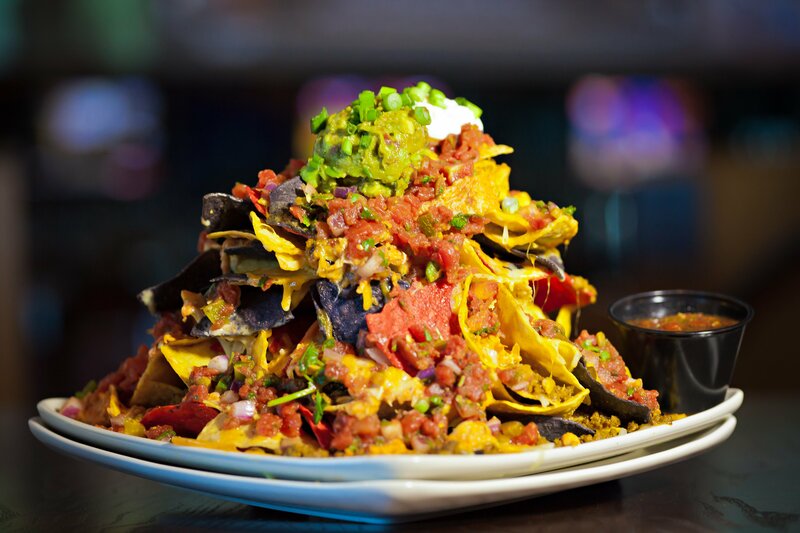 A plate of nachos at Big Al’s. This menu item is in-demand because of the generous portion and quality ingredients. Chicken is a consistent favorite, which Perrone attributed to some forms being healthier options and others being versatile, such as having buffalo style or mojo seasoning. Fried cheese curds are another top seller, because they are very popular in the state of Wisconsin. “We are a very tourist-driven industry; when people visit from all over the country they can’t wait to try traditional Wisconsin cheese curds,” Palmer said. 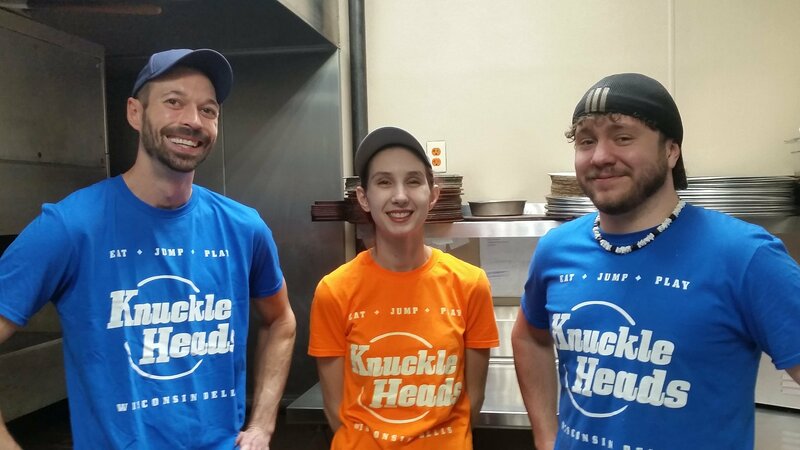 Shown, from left to right, are members of the Knuckleheads cooking staff, Patrick Diez, kitchen manager and Emma Lubbert and Zach Simacek, cooks. Fried cheese curds are a popular seller to people from all over the country who want to try this unique-to-Wisconsin treat. For Brandon Wilder, technology/programs coordinator, Buffaloe Lanes Bowling Centers, Raleigh, NC, burgers, nachos and fries rule supreme. “They are easier to eat items while bowling and are fairly inexpensive,” he said. At Big Al’s in Vancouver, Wash., Thomas V. King II, food and beverage director, said its famous nachos are popular because of their enormous size and quality ingredients. Steve Bartek, vice president of food and beverage, Bowlero Corp., reported that chicken tenders, chicken wings and nachos are tops. “They are all made from scratch with fresh ingredients, and are shareable items for large groups,” he said. Pizza is a huge success for Knuckleheads. 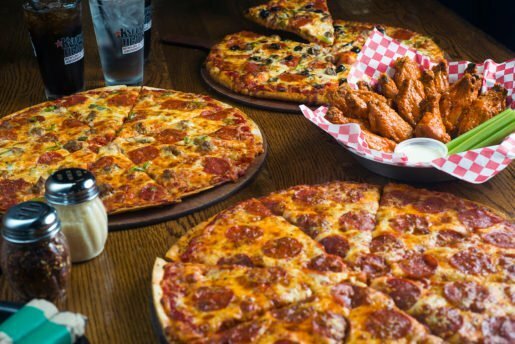 “Our 16-inch pizza can easily feed a family of four, plus they can choose different toppings on each half which keeps both children and adults happy,” the assistant general manager said. Brownies, in particular the “Fudgy Brownie,” is Big Al’s biggest seller in this area. “It is designed to be a sharable item, it’s an easy sell to a table that of people who want to share a dessert,” King said. Among the center’s five locations, the constant best-seller for Wilder is cookies, either chocolate chip or sugar. Pepsi products rule in the beverage category at Pin Chasers. However, Perrone has noticed an increased interest in non-fountain products in recent years. Specifically, specialty sodas in bottles and healthier non-carbonated beverages such as juices and iced tea are gaining popularity. The Netflix & Chill raspberry vodka drink is popular at Big Al’s in Vancouver, Wash. The location recently added what are called “dirty” French Fries to its menu. Sweet tea sells best at Buffaloe Lanes Bowling Centers. “We are located in the south and nothing beats a cold drink of sweet tea on a hot summer’s day,” Wilder said. 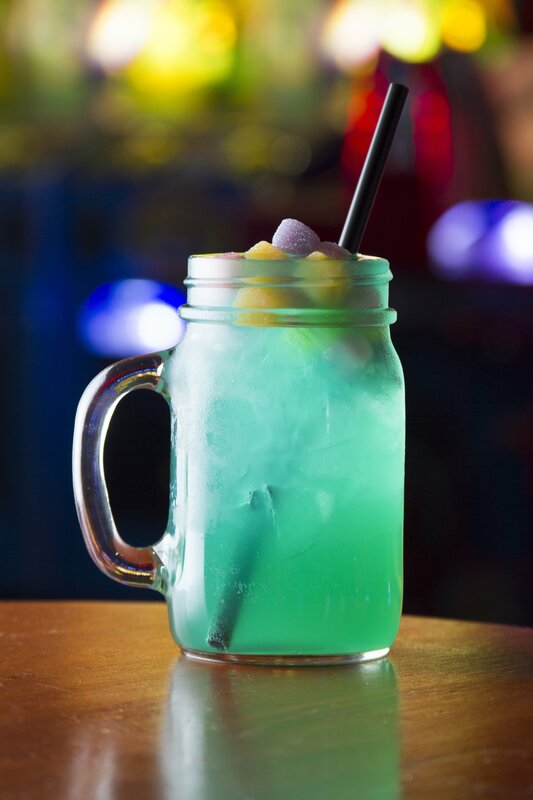 The most popular beverages at Bowlero Corp. currently are tiki-style and tropical-themed cocktails. The Mai Tai and a Hurricane are on its new menu; customers love them as the weather gets warmer. Fresh menu offerings are all the rage at Pin Chasers, including salads and ground beef burger patties. “We make as many items as possible from scratch,” Perrone said. Wilder said its most southern location offers home fries and potato cubes—a great alternative to traditional French fries. Another location has a great southwest eggroll, which includes shredded chicken and corn salsa in a deep fried eggroll. Its most northern center added mini donuts—which are cinnamon sugared, powder sugared or plain—a huge hit with kids. margaritas, 16-ounce beers and rum and cokes. Big Al’s recently added dirty fries to its menu. “Ground beef, peppadew peppers, beer-cheese fondue, cilantro and lime sour cream make this sharable item one of our top sellers,” King said. In addition to changing menu offerings, Perrone has made changes in his locations’ food experience and food quality. Traditionally, customers at bowling centers stood in line to order and get their food. “Our servers serve guests in lanes, creating a higher-end experience,” he said. The center is also using more China dishware instead of disposable plates. “We’re trying to get away from snack bars and casual fast food and instead offer restaurant level quality of food,” Perrone said. “We don’t want people standing in line when they could be spending their time participating in paid activities at our center, such as arcade or redemption games.” In addition, customers don’t like waiting in line and have limited time. Food truck style food is increasingly popular at Bowlero centers. These street food items with big flavors include tacos, sliders and French fries. 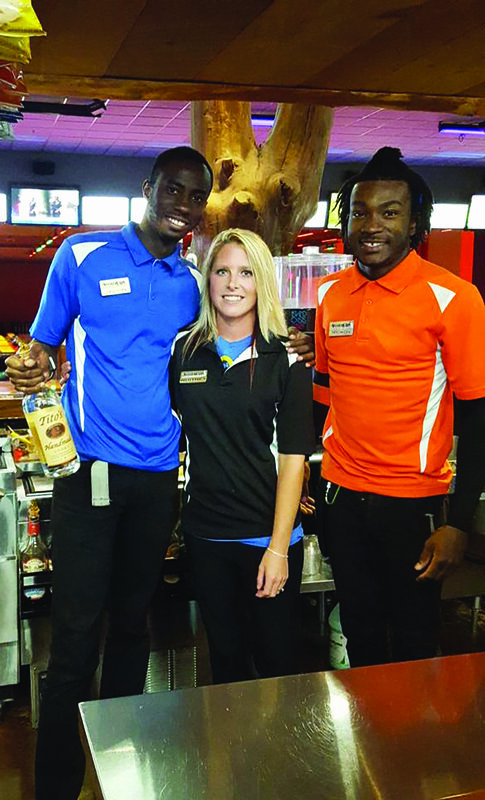 “These items not only taste great, but they are easy for customers to pick on while bowling,” Bartek said.